I enjoyed playing Shadow Warrior 2 at PAX East so much that I sort of wish it weren't a Shadow Warrior game. I don't feel any nostalgia for the gauche 1997 3D Realms original, and I wonder if Flying Wild Hog could've had more fun without being stuck to the property. But c'est la vie! 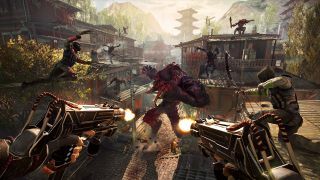 Shadow Warrior 2 is what we have, and the demo was a ton of fun. During the 20 minutes I played, I felt fantastically agile, bounding across rooftops in a tiered, open level, cleaving huge beats in two and assaulting them with arrows, electricity grenades, and bullets. With no stamina bar to worry about, I could endlessly ping pong around like an anime ninja blur, which designer Pawel Kowalewski comments on in the interview above. Watch the video to hear about what's changed since the 2013 reboot, and for more, check out 15 minutes of gameplay footage from last year's E3.